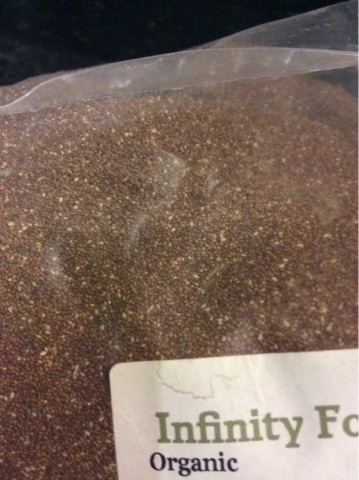 Some months ago we bought a large bag of whole teff grain, and I'm sorry to say we haven't used it nearly enough. 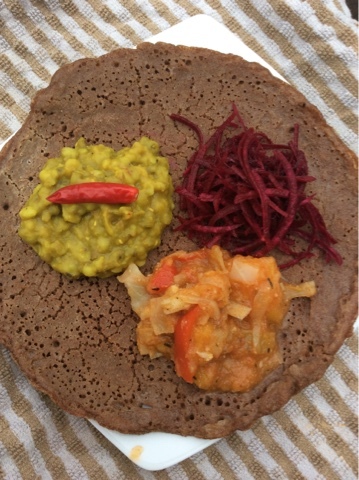 Last weekend, on spotting the teff lying invitingly on the shelf, I ground some in the blender to make teff flour and made some injera (Ethiopian teff pancakes) to go with some Ethiopian style split peas and vegetables. I cheated though, and instead of fermenting the batter with a sourdough culture I used a bit of baking powder and lemon juice to achieve that slightly sour bubbliness. A lot of traditional Ethiopian food is vegan, and vegetables like carrots, potatoes, onions, garlic, cabbage and beetroot feature heavily in the vegetable-based stews, called atakilt wat. For plant-based protein, you have dal-like split pea dishes, called kik alicha. We love the simple heartiness of these wholesome foods and the fun way you serve them on top of the injera and then tear off pieces of it to scoop them up. I made four large injera from the quantities in this recipe. It is not a gluten free recipe however, as I added some wheat flour. Mix everything together to form a stiff batter. Pour enough to cover the base of a non-stick frying pan, preheated and slightly oiled, like a pancake. Cook like a pancake- loosen at the edges with a spatula and gently shake the pan to prevent the injera sticking to the base. Do not attempt to flip it, however, as it is delicate. Instead, wait until bubbles have formed and the top surface has set. When it is cooked, slide it off onto a plate and repeat until you have used up all the batter. A few words about the vegetable accompaniments: there are lots of recipes to be found online, but as a general rule, think cabbage, potatoes, carrots and beetroot. Ethiopian beetroot salad is cold cooked beetroot and potatoes, but I just grated some beetroot raw with lemon juice. For flavouring the stew and the split peas think berbere (pepper, fenugreek, chilli etc. 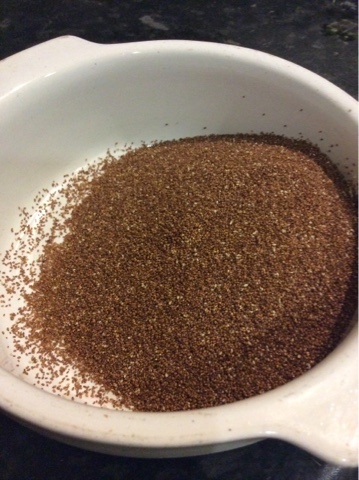 ), coriander seed, ginger and turmeric. If you crave simple, healthy and aromatic dishes, Ethiopian vegan cuisine may be just what you want- and it makes a change from more commonplace Asian and European dishes. 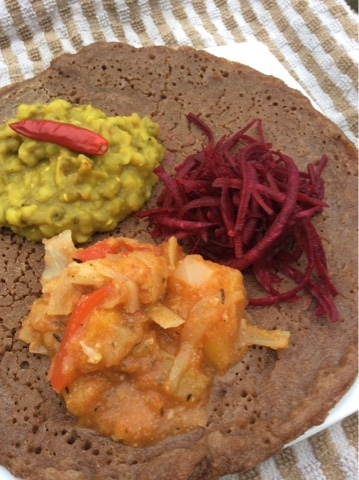 We'd love to hear from you via the comments if you have some favourite vegan Ethiopian dishes you like to make, or if you have tried making injera the traditional sourdough way. Looks amazing! For some reason I thought I already commented on this post - so sorry! I need to work with teff more in the near future! And I LOVE the Ethiopian Food I have had so far and looking forward to trying more!! !